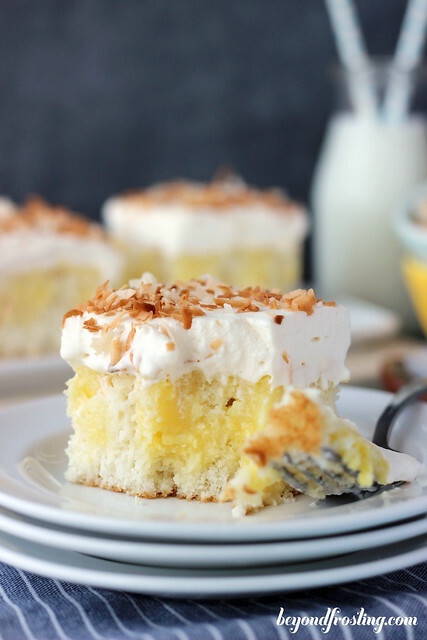 This poke cake is for all you coconut lovers out there. 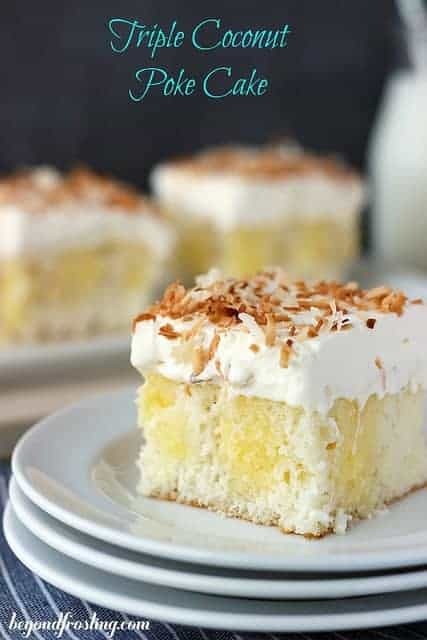 Triple Coconut Poke Cake is a coconut cake, drenched in coconut cream pudding and topped with a coconut whipped cream. I have a confession. I love the show Archer. When I first started dating my boyfriend, I was not into it at all. His trick was to play it OVER and OVER again until I like it. Turns out it worked. The jokes are a bit “grown up”, and I am usually not into any type of animated shows, but this show is just too dang funny to give up. This has nothing to do with dessert, at all, but just a little fun fact. Also, it’s Friday, finally! And it’s also a holiday weekend! I hope you are travel safety and enjoy some time with your loved ones! I just can’t stop with the coconut! It is around every corner. 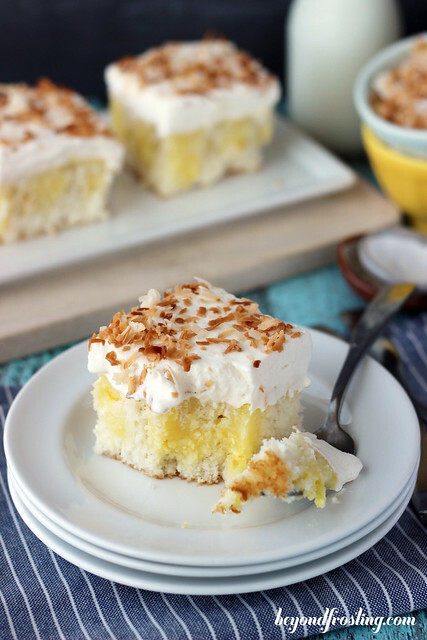 This poke cake is for all you coconut lovers out there. 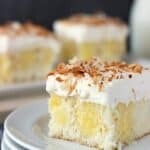 Triple Coconut Poke Cake is a coconut cake, drenched in coconut cream pudding and topped with a coconut whipped cream. 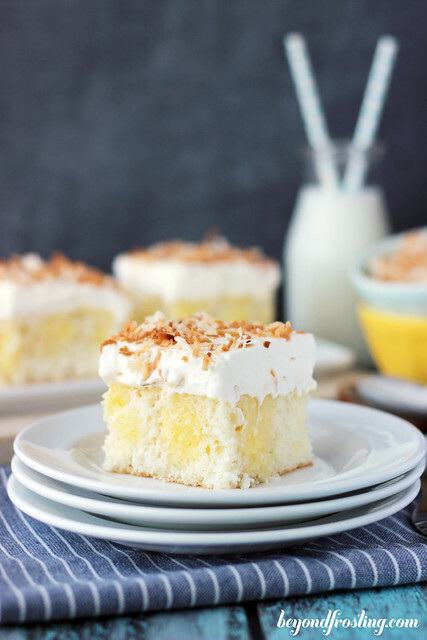 The coconut cake is a simple vanilla cake mix, with a touch of coconut extract. Since I believe most cakes look naked with a topping, I chose to sprinkle this with cake with toasted coconut. 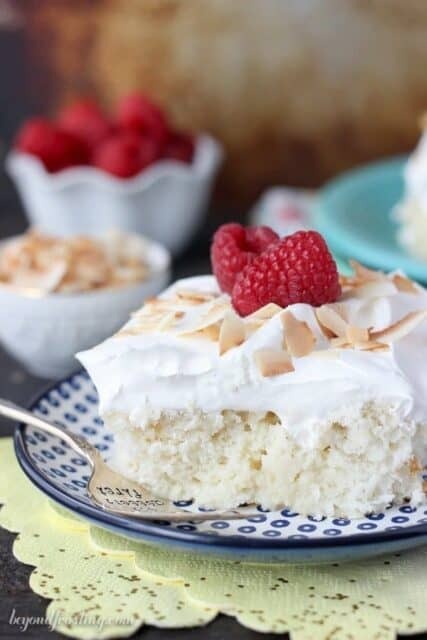 I first fell in love with this coconut whipped cream when I made my Coconut Lemon Poke Cake, and I knew I had to make an all coconut version. Some people dislike Cool Whip. Personally, I don’t have a problem with it. 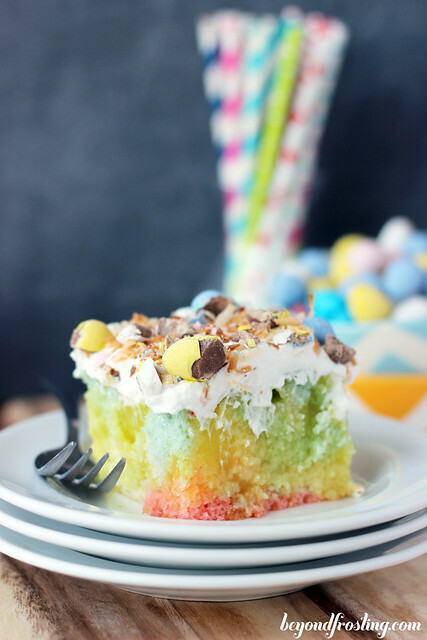 While this cake has a homemade coconut whipped cream, it can certainly be substituted for Cool Whip. However, you really shouldn’t be afraid of homemade whipped cream! It is quite easy and quick to throw together! Plus, you can make so many different flavors! Have you seen my Cinnamon Maple Whipped Cream or my Hot Chocolate Whipped Cream? How about cake batter flavor? I have mentioned before that I have a love/hate relationship with Walmart. I love it because they have a giant food section with things I can’t find anywhere else- like coconut cream pudding. BUT I hate going there because it’s always busy and I have no patience. Well I will tell you that this coconut cake is totally worth the trip to Walmart! Plus you can work off the calories from the cake by weaving in and out of people at said Walmart. Although, if I were you, I would totally check your local store first. Just saying. If you can’t find coconut cream pudding, you can easily substitute this for vanilla pudding. Or try adding 1 tsp of coconut extract to the vanilla pudding. The pudding is what makes this poke cake so amazing! For coconut lovers only! A white coconut cake with coconut pudding. Topped with Coconut whipped cream and toasted coconut. In a mixing bowl, combine white cake mix, egg whites, oil, milk and coconut extract. Mix until all ingredients until thoroughly mixed. When the cake has cooled, prepare the pudding layer by mixing instant coconut pudding with 4 cups of cold milk. Before the pudding sets, pour it over the top of the cake slowly and put the cake in the fridge to let the pudding set, about 15 minutes. The longer it sets the better. Spread whipped cream over the top of cake. Sprinkle with toasted coconut. This cake must stay refrigerated. This cake would be a HUGE hit in my house! It looks beautiful and delicious. Thank you Pam! I hope you get a chance to try it! This cake is like a dream come true Julianne! Perfect for Spring! Pinned! Thanks so much Trish! You are the best! This cake sounds amazing! And totally worth a trip to Walmart, which I have to agree with you, is not fun. I’ll be the first to admit that I have never heard of the show Archer! My husband pulled the same trick with the movie “Goodfellas” – don’t tell him, but you *can* see it too many times! Yes! I just recently made another trip to Walmart for Coconut pudding and I am totally hooked! There is a human that doesn’t like cool whip? What? This looks soooo scrumptious! I’d pay $25 for a slice with my coffee this morning. Yes I would. Nice photos! Totally. People get angry about it! I am not one of them. Happy Easter Debbie! Careful Rochelle, once you try a poke cake, you will be TOTALLY HOOKED! 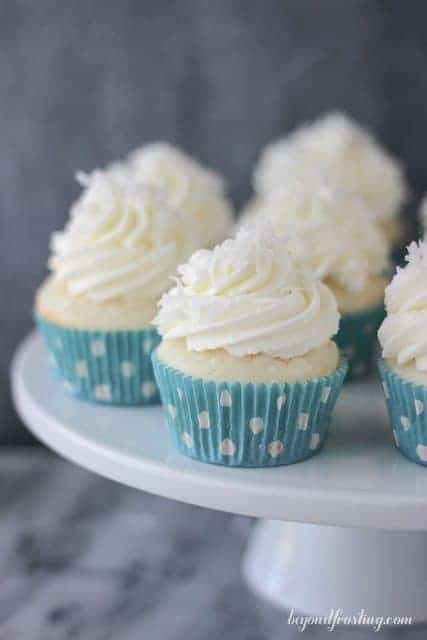 I am loving your easy poke cakes! Never apologize for coconut. Coconut is life. This is perfect for Easter! Pinned 🙂 and happy Friday!